Paddy Ryan, the local stonemason, remains somewhat of an enigma. Not a great deal is known about his life or origins despite being described as an ‘early character of the district.’ It appears that he did not belong to any association or group in Springwood because when his name was mentioned periodically in the newspapers it was only in relation to his profession. 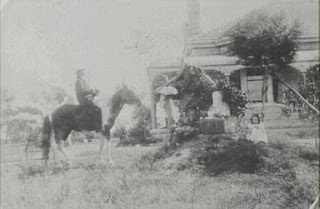 The earliest official record of Paddy is documented on the 1891 census, where it was said that Patrick Ryan lived in a private house on Grose Road, Faulconbridge. A few years later the 1894–5 electoral roll confirmed again that he was still residing at Faulconbridge. His occupation had changed, and was noted then as being a ‘farmer’. Andrew Ryan, a labourer of Springwood was also listed on the same roll, but it is not known if the two were related. It is not clear how much land he owned because his name does not appear on any early maps. However, it appears that the property he held was located in the vicinity of Grose Road and Chapman Parade. The road that is currently Chapman Parade was known initially as Grose Road, and the present day extension of Grose Road past the High School was known then as Links Road. More specifically, it would seem that Paddy owned the property where the Norman Lindsay Gallery is currently located. That home, along with several others in the district, attests to the high quality and enduring nature of his workmanship. Some years prior to the 1890s he is believed to have been responsible for the erection of several other buildings in the area. At Faulconbridge/Linden he is thought to have built Lady Martin’s Bath, Martin’s Folly and a home for Sir Alfred Stephen. Around c1882–3, in the same area, he was the stonemason who built Eurama/Weemala for Andrew Hardie McCulloch MP, to a design supplied by colonial architect George Mansfield. Paddy was employed again c1885–7 for the building of Everton for the Hon. John Meeks. Everton still exists. Paddy was most fortunate to have a ‘moneyed local’ clientele. According to the Nepean Times (2 June 1894), the skill of local stonemason Paddy Ryan was in demand again. This time he was erecting a stone cottage for Mrs Quarry (formerly Gibbes). The Times mentioned that the home was being built on land that lay along Lomatia Park Road. A paper written many years ago by Mrs Quarry’s grandson, Mr H.B. Gibbes, stated that ‘several attempts’ were made at building the cottage from stone that was quarried from a site nearby. Unfortunately Mr Gibbes did not elaborate on what the problem was. The home later became Stonehaven, a home for boys, which was demolished 1966–7 for the Great Western highway deviation. Several years later the Nepean Times (18 June 1898) related that P. Ryan, contractor, was about to ‘finish off’ the home that stood on property he had subsequently sold to Francis Foy of Mark Foy fame. Paddy had long been in the process of building the home—dubbed Erin go Brangh—but according to the newspaper the home stood unfinished for many years. We have no way of knowing how Foy came to know about the property because it is so far off the main road as to make it invisible to anyone passing. Perhaps Paddy advertised it for sale in the paper but, if he did, we have no record. Foy subsequently owned portions 4 (80 acres), 108 (42 acres) and 110 (50 acres) along the present day Chapman Parade. But it is not clear if Paddy Ryan was the original owner of all three lots. In March 1898 John Lawler, a Sydney bedding manufacturer, employed Paddy Ryan to build his stone cottage on a rather uneven piece of property that he owned in Railway Parade, Springwood. The home still stands today and is one of the finest in the district. It is listed on the Blue Mountains City Council heritage register. The erection of Lawler’s home did not pass without its share of drama. The quarryman (Paddy?) who was working on the project was served with a fine for having ‘too much powder on the job’, with insufficient means of storage. He was obliged to appear before the bench at Penrith Court House where he was duly fined. The name of Lawler’s home, Eringah, like Paddy Ryan’s unfinished home (Erin go brah), would suggest they both had Irish connections. In August 1903 the Nepean Times correspondent mentioned that ‘Mr P. Ryan was doing some good work as a stonemason at Mr Lawler’s new buildings’. Unfortunately, the reporter failed to specify where these buildings were! Almost a year went by without further news, and in July 1904 readers were told by the Nepean Times that Mr P. Ryan of Vale of Avoca had lately started in the poultry farming line. An amazing tale was told of an Orpington hen he had purchased from a Rooty Hill poultry farm that had laid 66 eggs without a break. The poor hen rested for a week before she started this amazing feat all over again! He was reported to be very pleased with his purchase. The exact location of Vale of Avoca is unclear, however a paperback entitled Exploring the Blue Mountains mentions a place with this name as being downstream of the Grose Valley. The first explorer into the narrow valley was William Paterson who thought it might be a gateway to the west. However, it is not known if this refers to the place of residence of our Paddy Ryan. Paddy is known to have married Kathleen (Kate) but no details are available as to where or when this event occurred. They had a son Patrick junior who was a contemporary of William and Percy Croucher. The three made a return trip on foot to Jenolan Caves in 1895. Paddy died in 1917, and proctor James C.J. Ryan administered his estate. Kate was his beneficiary. The 1920 electoral roll mentions Thomas George Ryan, railway employee, Tyneside Faulconbridge, Kathleen Ryan, St Martha’s Home Leichhardt, and Martin Ryan, Avoca, Archer Street, Chatswood, as owners of allotments of land at Faulconbridge. It seems safe to assume that Kathleen (his wife?) and Martin were relatives of Paddy but more research would be required to confirm if all three shared kinship.